i really liked this cute anime, but I was super disappointed in the fact the episodes were about 7min long each and the fact there was only like (10 i think) episodes. this anime could've gone a lot farther if they wanted to stretch out the story line. it's definitely something to watch to pass the time if you aren't sure what to watch at the moment. I need more episodes! This anime is worth the watch. it's funny and entertaining. Although, it does leave you slightly confused at times but with a story plot like this the episodes could go on for longer. The main character is cute and quirky but tough! again the only issue with this anime is how short the episodes are and the amount of episodes. I need to know what happens next! Me and my friend were watching this for the memes, but it turns out it was LIKE THE BEST ANIME EVER 999/10. It's surprisingly heartwarming. Also it's very gay but not gay it's conflicting but amazing at the same time. Also green guy is best guy can I marry him? The premise to this one intrigued me enough to watch it to the end, which is a first for a show like this, and honestly, it's ok at best for me. The main problems for me are the execution and the characters. 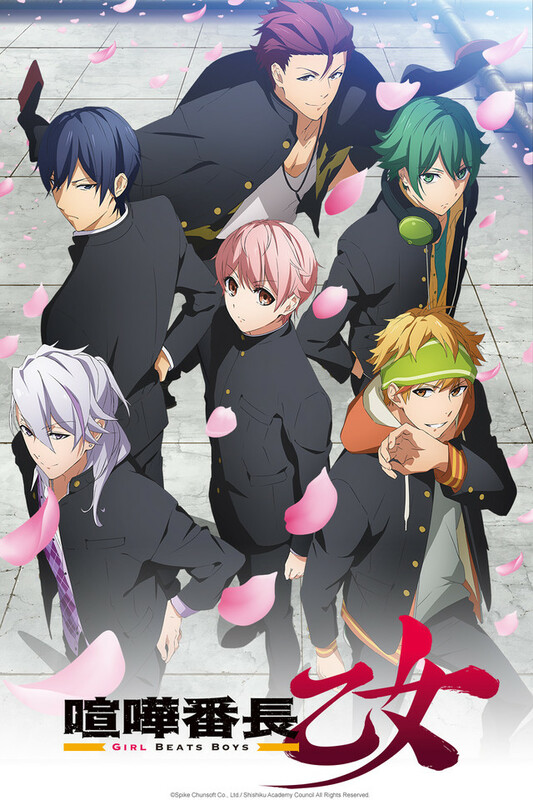 From the synopsis and first two-to-three episodes or so, it felt that this show was going for a rougher version of Ouran High School Host Club in a way, but the execution is quite bad in my opinion. The episode run times don't give much time for the show to feel fully fleshed out and the story structure gets quite predictable and boring after a while. The characters aren't interesting to carry the show either as the guys are mostly just more tired reverse harem cliches and stereotypes and while the protagonist does have more personality than most in the genre, she isn't on a Haruhi Fujioka, Yona, Kae Serinuma, or Sunako Nakahara level of groundbreaking, outside-the-box, or interesting either. Girl Beats Boys is a short form (eight minute episodes) martial arts anime, Hinako Nakayama is a girl who spent most of her life living in a orphanage without ever knowing her family or gaining a new one. One day she encounters Hikaru Onigashima, who claims to be her older brother, informing her the two are children of a powerful yakuza family and asks Hinako to swap places with him at a all-boys school for delinquents. Hinako’s new goal being to become the new boss of the entire school. There are plenty more short form anime out there, and I can say skipping this one wouldn’t be such a bad idea, kinda empty and limp overall, you wouldn’t be missing out on much. I asked my friend to make up the title, with no context. This anime was so pointless I was so mad at the end. Literally nothing happened in here and the episodes were so short. The idea was good but it failed to achieve anything. I was super disappointing and only watched in hopes something would actually happen. After watching I was just infuriated the whole day. But still a really fun and cute anime. There was zero romance which was a plus for me since I dislike anime with more than one love interest. The episodes were super short which made it easy for me to watch but I kind of wish they'd fleshed her relationships out with the other guys more. I also would've like to see more of her twin and older brother and an explanation on how she got separated from her family in the first place. But for what it was, it was super enjoyable and all the guys were cute so I can't complain too much. I do not like short series anime where the episode is only a few minutes long. I find it annoying personally. HOWEVER! I absolutely loved this! I loved the main characters and how she overcame everything learning how to fit in and be stronger still. She is by far one of my favorite cross dressing girls since Ouran Host Club! I'm sad there's not more of this! I loved this series from start to finish! While the plot isn't the strongest out there, it's definitely entertaining! I'm probably a little biased because I've always loved the genderbend type of anime, but I think what sets this one apart is not only the fact that (spoiler alert) there's never a big reveal with any of her friends, but also that she chooses to continue living as a boy in that high school. I do kind of wish they had explained why Hikaru wanted to do the switch in the first place, but also since they didn't make anything really clear I can assume that Hikaru is a trans girl, which I like very much. All in all, this is a great series and I would definitely watch it again!